A series of extra cases based on the GBA and DS game series. Alternative version: Gyakuten Saiban Official Anthology Comic: Mitsurugi-hen, Gyakuten Saiban Official Anthology Comic: Naruhodou-hen, Gyakuten Saiban: Turnabout Crossover, Gyakuten Kenji, Gyakuten Saiban: Sono "Shinjitsu", Igi Ari! Just to be clear, this is not an adaption of the games, but rather, brand new cases. Now, reading this a while back as someone who has only heard of the franchise, but never played the games, the manga was a tad confusing to start off with. I say this only because it seemed to skip over the entire background of any of the characters, and left me wondering who many of them were, why they were there, and wondering if I had missed something. However, if you can piece together the big picture, it's a few thoroughly entertaining cases. After reading the manga, I went out and played through the Gyakuten Saiban series, and the first game of the Gyakuten Kenji series, and it changed my opinion of the manga a bit- so if you have already played the games, this part might be a bit more valuable to you. The cases are short and simple. None of them are incredibly perplexing or s never continued. The characters you've grown to love come back very...mind boggling compared to the game. That would most likely be my largest complaint here, but understandable, seeing as how the series wa well... in character, if not a bit more developed, thanks to them moving out of the very static visual novel format. Nothing of the story itself seems to stray out of place compared to the games. The art style is a bit different, but everyone is still easily identifiable. 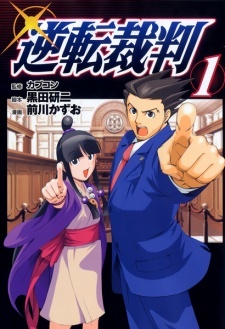 I might not suggest this to people who have never played, at the very least, a Phoenix Wright game, but otherwise, I think it's an entertaining read- especially once you've run out of games to play. Admittedly I go into this review with a huge bias. I LOVE the original &quot;Gyakuten Saiban&quot; games with a frightening, obsessive passion. I've admittedly only read a few chapters of the manga adaptation, and thus far, it seems to be pretty good. The characters seem pretty true to their game counterparts, and it's interesting to see the case investigation in the third person as opposed to first-person playing as Naruhodou/Phoenix. That being said, a few things already caught my attention. The cases are too short and simple for my taste. The cases in the game are complex, twisting puzzles that can take quite a long time to figure out, but a blast nonetheless. The manga limits the duration of each case to a few chapters, tops, and only so much can be crammed into one manga chapter. In that sense, this may be likened to &quot;Great Detective Conan&quot; (&quot;Case Closed&quot;), but &quot;Conan&quot; pulls off the one-chapter case with better pacing and depth. That aside, the manga is still great fun to read, good detective-mystery pulp with characters who (if they stay true to their game counterparts) are all batshit insane. This can be a good starting-ground for those not familiar with the games, but in my opinion, the stories and cases in the games are far, far better. I hope the quality of the manga improves with each installment.